Having posted a recipe yesterday for the Northern Climes &Winter Blues, colds, coughs & chest infections, I have decided to balance it up to-day with a cooler recipe option for those hot summery days I am experiencing here in Australia! IS ANYTHING WRONG WITH CANNED JUICE? For years, the phrase vegetable juice meant to me something that came in a can or bottle. Now, if I find myself in that aisle of the supermarket, I definitely pass on by. Why? Because I don’t want juice that’s had much of the nutritional value cooked out of it, some toxins thrown in, and a bunch of salt and sugar added. Certainly these days fresher options in cartons have become available; I can't comment on their nutritive value, I expect they are a better choice but watch for added sugar & sweeteners. 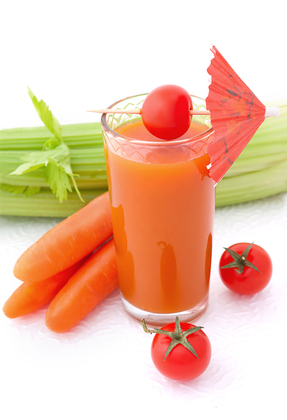 Fresh vegetable juices are truly delicious. About ¾ of a cup of vegetable juice is equivalent to several servings of vegetables. I don’t personally get all my daily fruit & vegetables in juice form, but including a number of servings a day in freshly squeezed juice is a wonderfully healthy option for anyone. Don’t feel limited..... you can juice your own veggies using almost anything you have in your refrigerator or garden. Your personal preference regarding taste will definitely be a deciding factor! In fact, anything you find in your produce section that’s deeply, richly colored is perfect for juicing. I like to sometimes add different items, like tossing in alfalfa or bean sprouts, even cabbage—bean sprouts can be rather earthy tasting, but remarkably rich in vitamin C.
I have found it helpful to record my experimental vegetable juice recipes in a notebook, approximating relative quantities as well as choices. I found out my favorite combinations very quickly by doing this. Remember these juices are highly concentrated, so some of you may like to add some water with ice blocks; an extra apple or two helps if you find predominately green juice, slightly bitter or lacking sweetness or unsettling for the tummy. This phase usually passes quite quickly! What about the best vegetable juicer? Personally, when juicing vegetables I favored the Champion Juicer for many years but more recently I purchased a Hurom Pro ( Oscar HU-400Pro to be exact). I do not have any commercial interest in any products, machines, or kitchen gadgets that I may mention in my posts, so my recommendations are always purely personal! The Hurom Pro Juicer gently cold presses to retrieve juice rather than shredding & grinding & will even do wheat grass & greens with ease & grace; it also easily handles tossing in a chopped lemon, skin & all, the same with cucumbers, carrots, watermelon & so forth, adding only small amounts at a time........so many nutrients are contained in organic or unsprayed fruit & veggie skins so no need to peel them provided they are holistically grown without chemicals. Another feature which I like, is this machine seems to leave a little more fibre in the juice , & gives the opportunity to chew the juice, which stimulates saliva. The importance of saturating each mouthful with saliva to begin the digestive journey, is often over looked. Saliva contains the enzyme, ptyalin which initiates digestion, so rather than gulp down a juice, it makes sense to maximize the benefits & effectiveness of consuming freshly made juices. Is the Hurom Pro the best Juicer, I honestly don't know, but I absolutely love it and....it is easy to clean! There are lots of other good ones out there I'm sure. Vegetable Juices and Green Smoothies are excellent for easily including more fruit & veggies into the family diet. Those who juice in the morning or enjoy a combination of blended fruit & veggies as a Smoothie, find that it helps the day get off to a great start with more energy & enthusiasm for the tasks at hand! Please note that adding a lot of sugary fruits to any mix can affect your blood sugar levels, particularly if you are Diabetic, so go carefully with these & monitor the amounts you are using. Whether you stick with casual juicing or you elect to make Vegetable Juicing &/or Green Smoothies a part of your daily healthy lifestyle, you’re in for a treat—Naturally! So delicious to enjoy anytime during the day! This combination usually makes about a litre of juice, (1000 mls or 1 quart) Place in an insulated "Cheeki" stainless steel water bottle with some ice. The Insulated water bottles are marvellous, fluids keep cool or hot all day, so great for cool drinks & hot soups. 3 cups of Spinach/ Chard/Kale or greens of choice. One can use 1/2 Carob with 1/2 Cocoa if it is too chocolately. Some even warm this smoothie as an evening treat using fresh bananas, not frozen ones. This becomes a healthy hot chocolate, especially in the winter months.....children, big & small, love it!